Extranet Collaboration Manager (ExCM) is used by many organizations as a tool to provide the best extranet security possible when collaborating with suppliers and clients. Because of this, we are frequently asked by our customers if they should use a unique username or an email address as the username, and what are the advantages and disadvantages of doing this? Below you will find some of the most common pros and cons for using an email for a username verse using a unique user supplied username. So, you have weighed the pros and cons and have decided that your organization would be better served by using a user-supplied username instead of an email address, but now you need to know how to change the ExCM settings to allow the new format. You can simply change this to "false" and have separate usernames and e-mail addresses. 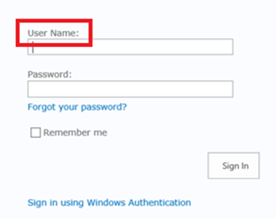 Now you have a Username and E-mail Address field in the registration form. Note: Existing users will still need to use their e-mail address to authenticate...this will only affect users created after you make the web.config edit. 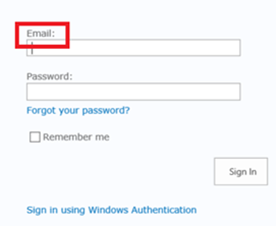 Now that you have decided to keep the default settings and use the user's email address as the username, you notice that the default ExCM sign-in screen shows “User Name:” instead of “Email:”. What if you want to change the verbiage on the sign-in screen to show “Email”? To do this you will need to browse out to "C:\inetpub\wwwroot\wss\VirtualDirectories\COMPANYURL\App_GlobalResources" and open the excm.en-US file and make the appropriate change. Once you have opened the file you can run a search for “User Name”, then look for the "<value> User Name: <value>" and change “User Name” to “Email”. Next, save the file, and run an IIS reset. Refresh your browser and you should see that the sign-in page now shows “Email:”, which will hopefully make things less confusing for the end user.